Use the Image component to add avatars to your design. Use the Design System SVG sprite maps to include icons in your designs. Describe markup gotchas when working within Visualforce. In this section, we’re going to brighten things up with images and an all new set of beautiful icons (more on those below). This may sound straightforward… an entire unit on images, really? However, these are key components and in particular you’ll see that we are using some cutting-edge technology for our icon markup. Plus you need to brighten up your sample pages to earn those Trailhead badges. Before we get into the code, a note on accessibility. Remember that every <img /> tag should have an alt attribute for assistive technology users. If the image carries information, set the alt to a clear concise description. If the image is merely decorative, or redundant to adjacent text, set an empty alt attribute like so: <img alt="" src="decorative-image.jpg" />. Image-wise, the Design System includes special styling for avatars. You know, those hip circular images you see around the internet these days. A common pattern for including images in web apps is to include an image and text side by side. The Design System has a component to make this super easy, the Media Object. Preview your page and notice how it has started to get more visually appealing. The base class of the Media Object component is slds-media. It can be applied to any container element, here we use a <div>. Inside the container, we provide a figure (the image) and a body (the content). The figure, i.e. 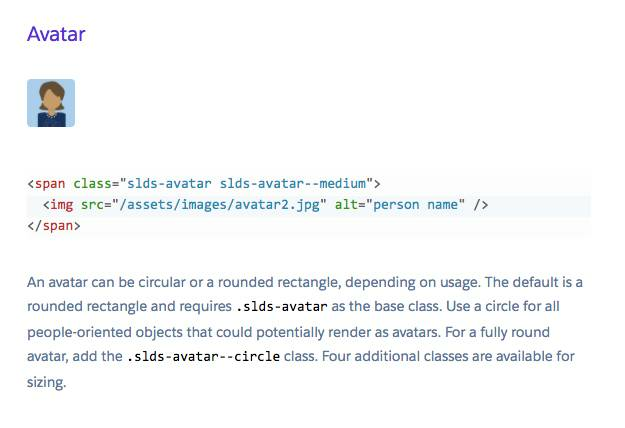 our avatar, is contained inside a <span> with the class slds-media__figure. The avatar image is specified with a standard <img /> element. You could also include an icon here (see below). The body is a <div> with class slds-media__body. This wraps the header text we used earlier. Updating the Salesforce icons was a huge priority for us as we embarked upon this work. Let’s face it, the existing “clip art” was looking a bit haggard and 90’s. Hence we are very excited to offer this set of exciting Technicolor icons covering a wide range of use cases for you to use in your own apps. Action - And last, but not least, the good ol’ action category. We utilize these icons for a fairly specific use case within our mobile UI. You’ll notice some duplication here with the Standard and Custom sets - don’t panic, you’re not going crazy. It’s likely you can ignore this category altogether and still have enough icons for any use case you can dream up! The icons are supplied both as individual PNGs and SVGs, as well packaged up inside SVG sprite maps. Each of the above icon categories has its own sprite map under /assets/icons. Sprite maps are our recommended technique for including icons in pages. The advantages of SVG sprite maps over traditional icon fonts include more fine-grained CSS control and easier positioning in components, as well as better resizability of vector-based SVGs. This final advantage is a boon for responsive design. Vector-based images make clean art at any size. PLEASE NOTE: Current versions of Edge, Google Chrome, Safari and Firefox already support SVG sprite maps. To use SVG spritemap image icons with Microsoft Internet Explorer 11 you will need to download a small script called svg4everybody. After you download svg4everybody, add the svg4everybody.min.js script as a static resource, include it in your pages, and call it in a <script> tag. Please refer to the full instructions on the svg4everybody website for more details. The advantages of using this icon technique (as outlined in the previous paragraph) more than make up for this extra step. SVG sprite maps are also why we had you add the xmlns and xmlns:xlink attributes to your <html> element. The reason for this is to configure the SVG and xlink namespaces within Visualforce. Again, a tiny bit of work for a big payoff. Let’s step through this element by element, and class by class. Since the icon is stand-alone and carries meaning we place it inside an outer span with the slds-icon_container class. The icons have no background color out of the box. In order to set one, we apply a second class to the span. To use the default color for a particular icon, construct the name of the icon's specific utility class by concatenating slds-icon-, the sprite map name, and -icon. Apply that class to the <span> element. In the example we are using the "standard" sprite map and the “account” icon so the class is slds-icon-standard-account. Inside the <span>, we have a <svg> element with the slds-icon class. The <svg> element in turn contains a <use> tag that specifies the icon to display based on its xlink:href attribute. First select the icon you want to use from the icons page. Make a note of which category it is in (action, custom, doctype, standard or utility). Complete the xlink:href attribute by concatenating the category sprite (e.g. “standard-sprite”), /svg/symbols.svg# and the specific icon within it (e.g. “account”). Hence, the path assets/icons/standard-sprite/svg/symbols.svg#account in the above example. If you are using MSIE, be sure to use a recent version and include the svg4everybody script in your page as described above. Finally, check the page in your browser Developer Tools for really crazy esoteric issues. Good luck. After the <svg> tag, the assistive text is contained within a span with the slds-assistive-text class. For more information on using icons, such as changing icon colors or size, see the Icons component documentation on the Design System website. Preview your page and you should see something approximating a real user interface. Now review the unit and note how many lines of CSS this took. In the next unit we work on one of the most renowned Salesforce pages: the infamous record home page. This will draw together the skills and components we have learned in the units so far, as well as introduce some additional Design System components.